7) […] In the first eight and a half (8 1/2) months of 2014, prior to Lampe’s bankruptcy scare, Ellora’s Cave had a total of 154 books go out of print for various reasons—mostly sales below threshold for rights reversions. In the twelve days between Lampe’s defamatory blog [post] and the filing of this suit, Ellora’s Cave had requests for reversion of 404 titles. 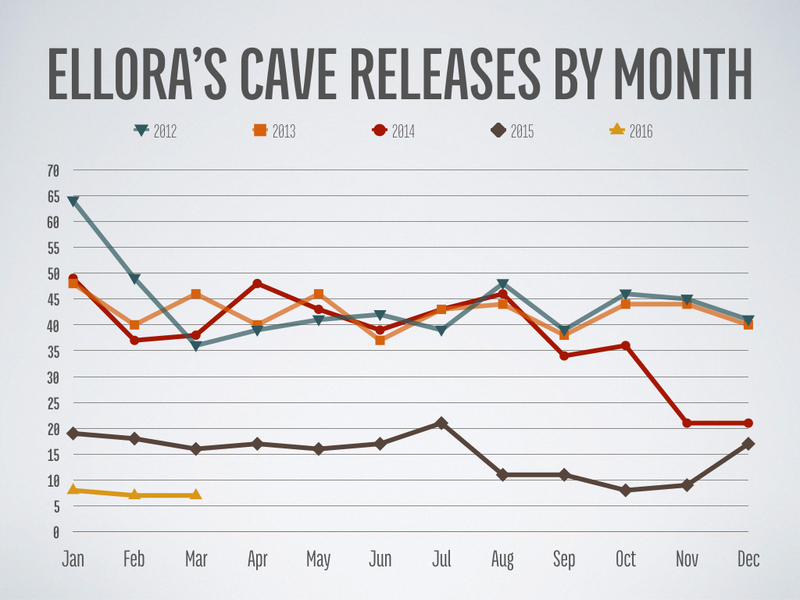 How many reversion requests were there pre-TCCoEC (“The Curious Case of Ellora’s Cave” published September, 2014) in 2014? What percentage of the 404 requests immediately post-TCCoEC were for books below reversion threshold? If all or most of them, then there was no damage. What percentage of EC’s total catalog did the 154, 404, and 1250 numbers comprise? It was the 1250 that stuck with me. 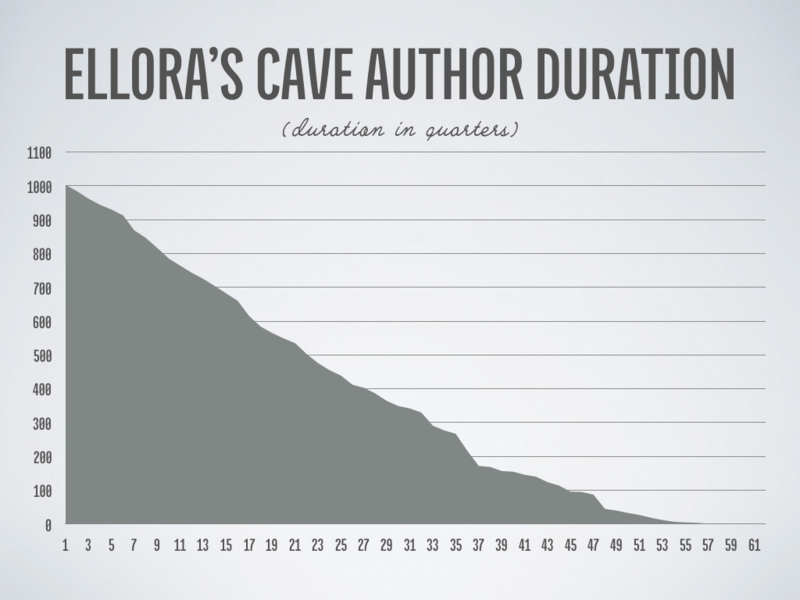 Ellora’s Cave had published around 500 books (thumbnail I had) over the prior year, so 1250 would be 2-1/2 years of work. Based on the assumption that they’d very recently hit their peak (in 2012 and 2013, then there was the 2014 reported Amazon sales drop), I expected that other years would have fewer books published. That expectation turned out to be in error on my part…which I’ll get to after I update the usual. Essentially, I sucked in publicly available data from various sources. Archive.org scrapes of EC’s site from various time periods, including when EC’s site was on Jasmine Jade (dot com). Ellora’s Cave’s site for more recent time periods. Up until now, I’ve only had author counts going back to 2013. Before then, Ellora’s Cave’s site was different, and was hosted for years on jasminejade dot com rather than ellorascave dot com. Thanks to archive.org, I’ve got author counts going back to early 2004. 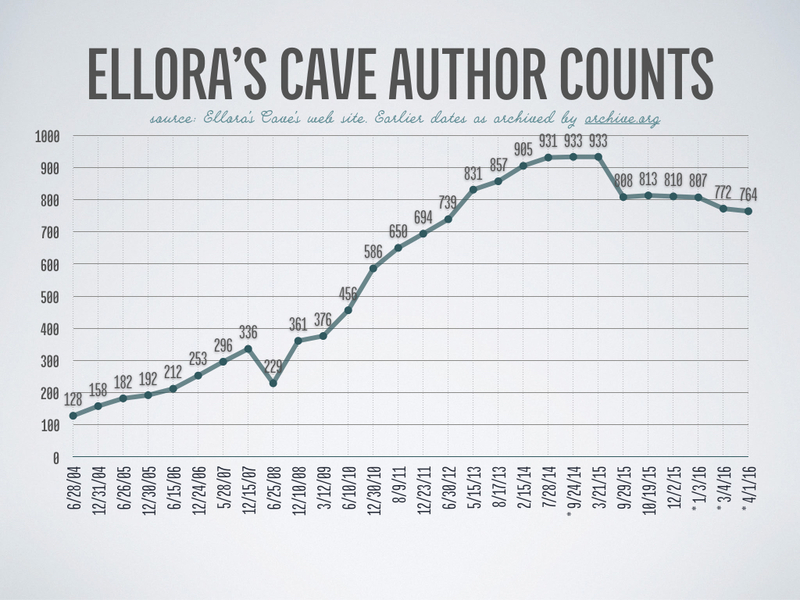 A bit later, I show that the current active (per Amazon) data is 737 authors, so Ellora’s Cave has lost nearly 200 authors since the peak screen grab in September 2014, back when it claimed EC had 933 authors in print. 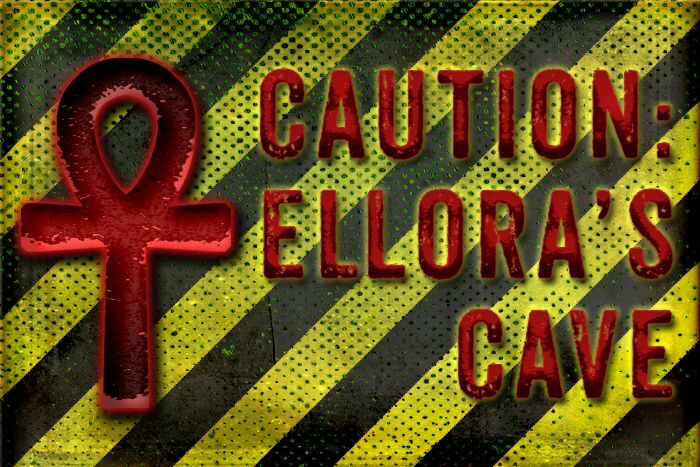 This last month, EC published three new authors, bringing Ellora’s Cave to a total of seven new authors published this year. I count 22 authors from in-print Amazon ebooks who are not included on EC’s site. One of them is Tia Isabella, a pseudonym of Tina Engler’s. Ellora’s Cave’s site shows 42 people whose only books are paperbacks, or paperbacks and ebooks (and the ebooks are not on Amazon), or no books at all. All but a handful are authors whose books are in the process of reverting. Not all authors are listed on multi-author books on Amazon. Notably, the 72-story boxed sets of Cavemen stories show one author each. In cases where all authors are listed on multi-author books, not all authors of those books are listed on EC’s site. Example: Doreen DeSalvo. Author is new to EC and doesn’t yet have books on Amazon (or EC’s site for that matter). Author is listed more than once on EC’s site. But now I also have all the information for books I vacuumed in from various sources named up top. DISCLAIMER: This is based upon limited information. If anything, the numbers pre-2012 are artificially low. And yes, there really was a ginormous spike in November 2009; Amazon data shows EC has at least 920 ebooks with a release date or publication date of November 1, 2009. That said, according to the information I have, Ellora’s Cave published fewer books last quarter than they have since at least Q1 2004. 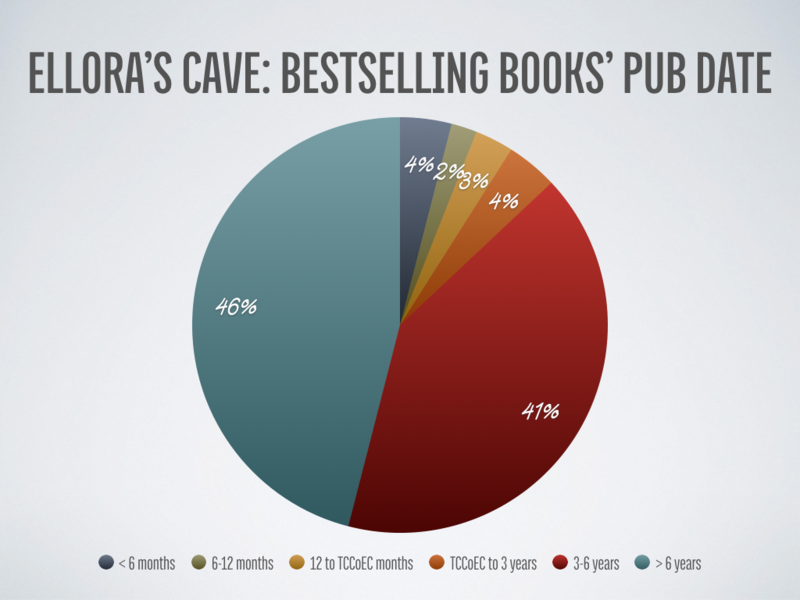 From this, my initial intuition was incorrect: 2012-13 were not the best years of Ellora’s Cave in terms of number of books published. Excluding the anomaly quarter (Q4 ’09), the highest number of books per quarter appears to be Q3 ’10, when 191 books were published. 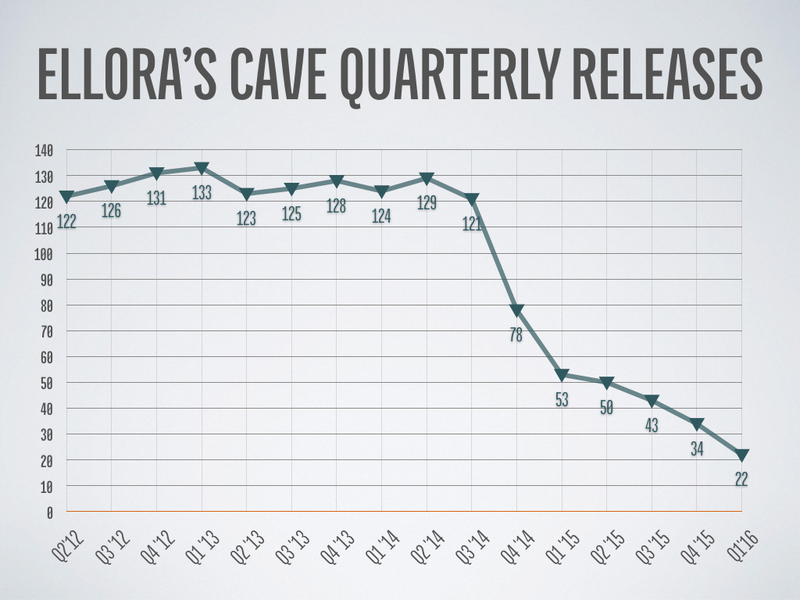 After Q1 2012 (when Fifty Shades of Grey came out in ebook form and first hit the NY Times Bestseller list), Ellora’s Cave’s release numbers held in the same range (a third below the peak) until the second quarter of 2014, and have been dropping since. Amazon 3,049 24 4 ? ARe 3,089 25 ? ? You might think that, okay, 24 of the 25 free books are the same books on ARe and Amazon. That would be incorrect. Four of the ARe titles aren’t free on Amazon (or not on Amazon at all). The reverse is also true, naturally. One of the things I’ve talked with various authors about is fixed-term contracts, and at least one author I know is a fan of seven-year contracts. So imagine my surprise when I chart this, which asks the question: How long between when an author’s first seen (first book or first seen on EC’s web page) and last seen (last book or last seen on EC’s web page) in quarters? Note that these numbers may represent one or many books, though I’ve excluded authors first published this year. A quarter of the authors left within three years. Half the authors left within 5-1/2 years. A quarter were still with EC at 35 quarters (8-3/4 years). These numbers may adjust significantly if I get more information about earlier periods of time. However, they do lead into the three new charts I have. 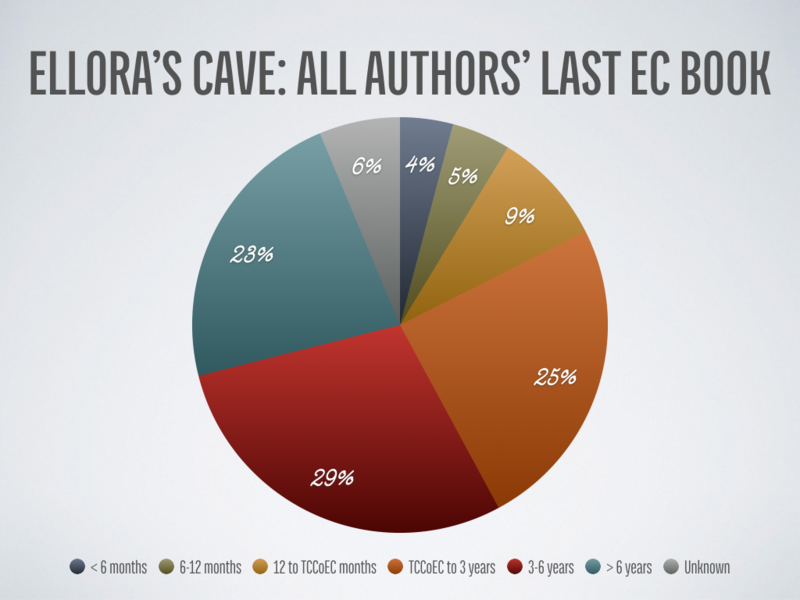 Of the existing EC authors (whether Ellora’s Cave still publishes them or not), when was their last EC book published? I grouped this into time periods. Unknown includes those where I have no publication information or those who do not yet have a book out with EC. So what this is showing us is that just over half haven’t published in at least three years, and that’s a long time before TCCoEC. Further, another quarter of EC’s authors haven’t published a book with EC in the interval between TCCoEC and three years ago. Now, let’s look at the same, but only for authors with current EC bestselling books (per Amazon). This is an answer to the “Who’s left?” question. As you can see, half of them haven’t published with EC in at least three years, and almost a quarter stopped publishing at some point between three years ago and TCCoEC. Two of Ellora’s Cave’s post-TCCoEC authors have been fairly high ranking for EC, though not in NY Times/USA Today bestseller territory. Perhaps the most disheartening chart, were I an EC principal, might be this one. Eighty-seven percent of the current bestselling books (per Amazon data) were published three or more years ago. I don’t know what to say other than I’d expect to see a greater portion of more recent books as bestsellers…if Ellora’s Cave were a healthy publisher. This can’t be anything relating to TCCoEC since three years ago was well before the article was published. Nor can it be the effects of TCCoEC, since we’re looking at the top 100 bestsellers published by Ellora’s Cave—and not relative to other publishers. 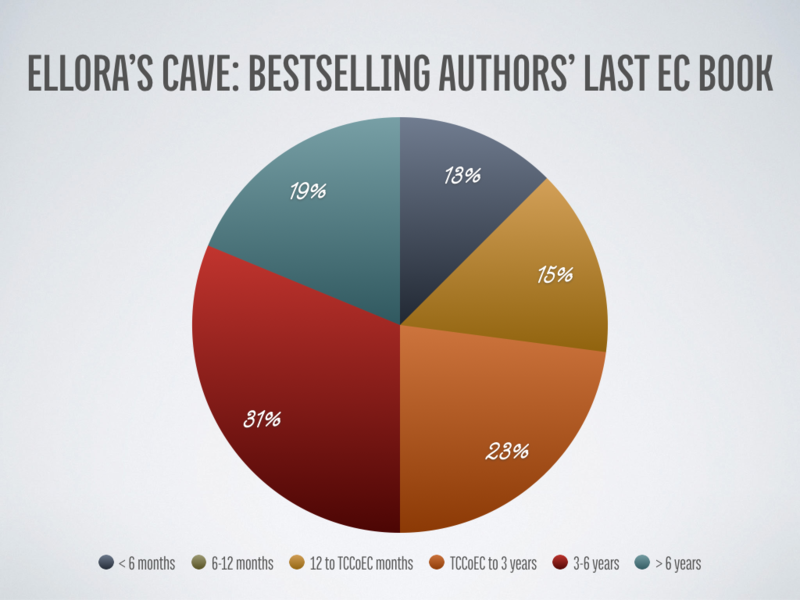 Up until TCCoEC, Ellora’s Cave allegedly had the pick of the pack, new author wise. Three years ago was Q2 ’13. 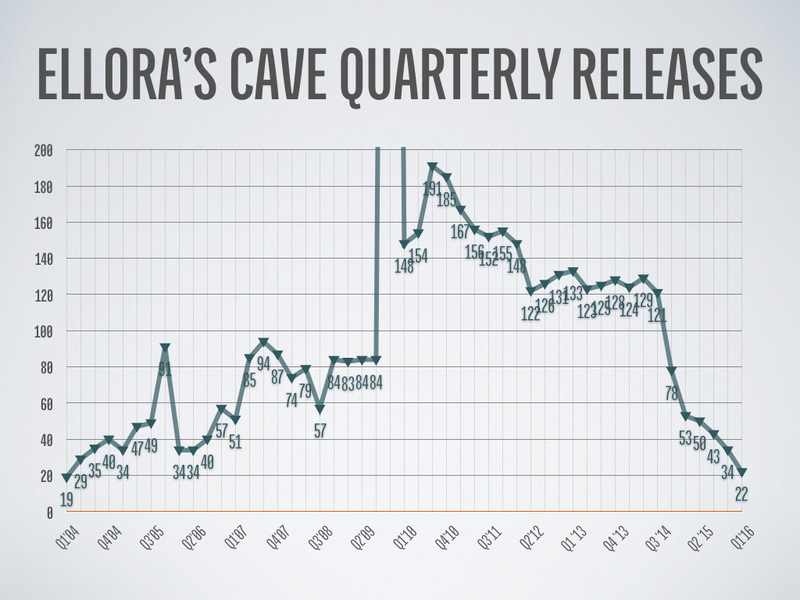 Ellora’s Cave has published 1,046 books from the start of Q2 ’13 through the end of last quarter, comprising 34.9% of the 3,049 books still in print. So why do those thousand-ish books comprise only 13% of EC’s own bestseller list? Ultimately, I’m putting together a WordPress plugin of books that had previously been EC books or written by former EC authors. This is more an interesting exercise in plugin writing and dealing with the frustrations of figuring out how to fetch Amazon data. Random fact: did you know you can’t query to find out what a Kindle book’s price is? Nope. Can’t. You can query most or least expensive, but that’s it. Very strange. Note: part of this post I wrote as much as a week ago, so some of these numbers are out of date.